The large—and still growing—pulp and paper industry is a capital- and resource-intensive industry that contributes to many environmental problems, including global warming, human toxicity, ecotoxicity, photochemical oxidation, acidification, nutrification, and solid wastes. This important reference for professionals in the pulp and paper industry details how to improve manufacturing processes that not only cut down on the emission of pollutants but also increase productivity and decrease costs. 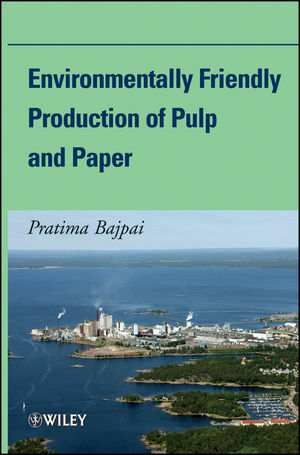 In addition, the book includes a discussion on recent cleaner technologies and their implementation status and benefits in the pulp and paper industry. Covering every aspect of pulping and papermaking essential to the subject of reducing pollution, this is a must-have for paper and bioprocess engineers, environmental engineers, and corporations in the forest products industry. PRATIMA BAJPAI is presently a technical consultant in the pulp and paper industry. She has over thirty years of experience in research at National Sugar Institute Kanpur and Thapar Center for Industrial Research and Development in India, and University of Saskatchewan and University of Western Ontario in Canada. Her main research activities are in the areas of pulp and paper, and industrial and environmental biotechnology. Dr. Bajpai has published twelve books and contributed over seventy-five articles in peer-reviewed journals. She has also contributed chapters to a number of books and encyclopedia, obtained eleven patents, and has written several technical reports. 2 Overview of Pulp and Papermaking Processes. 2.1 Raw Material Preparation and Handling. 2.3 Pulp Washing and Screening. 3 Environmental Issues of the Pulp and Paper Industry. 4 Emissions from Pulp and Papermaking. 5 Cleaner Production Measures in Pulp and Paper Making. 5.3 Mechanical and Chemimechanical Pulping. 6 Recent Developments in Cleaner Production. 6.1 Use of Cooking Catalyst. 6.4 Removal of Chelating Agents. 6.5 Energy-Efficient Thermomechanical Pulping Processes. 6.6 Recovery of Boiler Ash and Carbon Dioxide Gas to Produce Recycled Mineral Fillers. 6.7 Impulse Technology for Dewatering of Paper. 6.10 Total Site Integration Tools. 6.11 Wastewater Treatment for Water Recovery and Reuse. 6.12 Biotechnologies for Cleaner Paper Production.